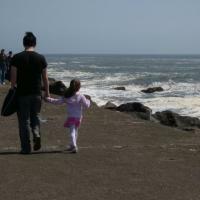 I went to the coast with my niece and my gf. We meet a gaurd cat at a light house named Bonnie, walked along the coast, picked shells and rocks for my mother and listened to this mix on the way there. I love the Pelican and Air tracks... and lighthouses. +Nice! beautiful. i miss lola. glad you were able to spend some quality time with her. This is a real quality mix. Too bad there're no descriptions, but I know most of the music so I can see how it goes together. - FOR NO "LIGHTHOUSES TALE" BY NICKEL CREEK.